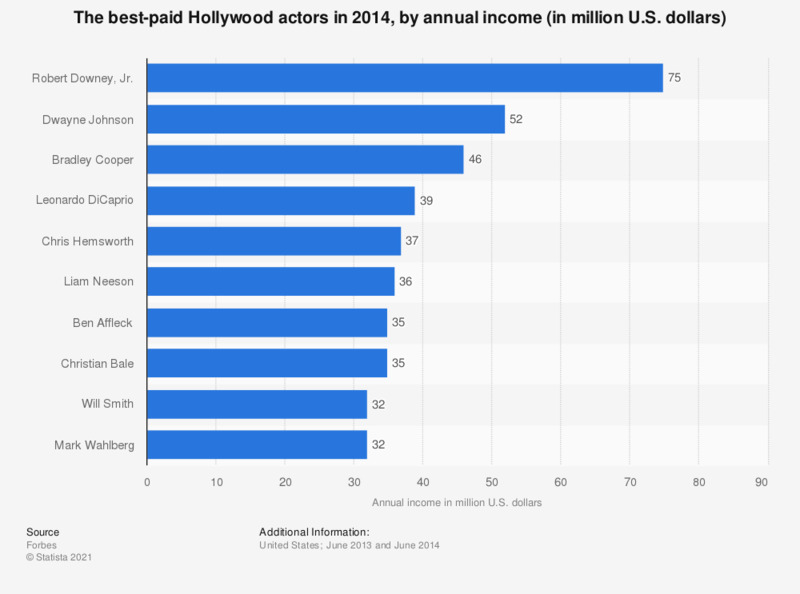 This statistic displays the earnings of Hollywood’s best-paid actors between June 2013 and June 2014. Christian Bale ranked eighth, with an income of 35 million US dollars. Dorothy Pommerantz, a Forbes journalist, annually estimates the earnings of the leading Hollywood actors. According to her calculations, Robert Downey Jr. was the best-paid actor in the 2013/2014 season, with an income of 75 million dollars. A year earlier, he also topped the list. Downey Jr. owes this success to his role of Ironman in “The Avengers” and “Ironman 3”. The former, released in April 2012, was the highest grossing movie of 2012 both in the United States and worldwide, with box office results of 1.51 billion and 623.4 million dollars respectively. The latter still topped the list of the highest grossing movies of 2013, three months after its release in May 2013 – leaving the second ranked movie (‘Despicable Me 2’) over 80 million dollars behind. Adam Sandler’s income has not changed between 2011/2012 and 2012/2013, amounting to 37 million U.S. dollars in both periods. This amount, however, ranked him second in 2011/2012 and only seventh in 2012/2013. His 2012 roles include Donald "Donny" Berger in Sean Anders’s „That’s My Boy“ and the voice of Dracula in Genndy Tartakovsky’s “Hotel Transylvania”. Sandler also ranked seventh on a different Forbes ranking – he was the seventh most overpaid Hollywood actor of 2012, earning his movies just $6.30 for each dollar of his pay. This list was topped by Eddie Murphy, with a whopping $2.30 of box office revenue for each dollar of his pay.